I am not a big lip gloss person, I do buy a gloss here and there but they're not something I usually reach for. 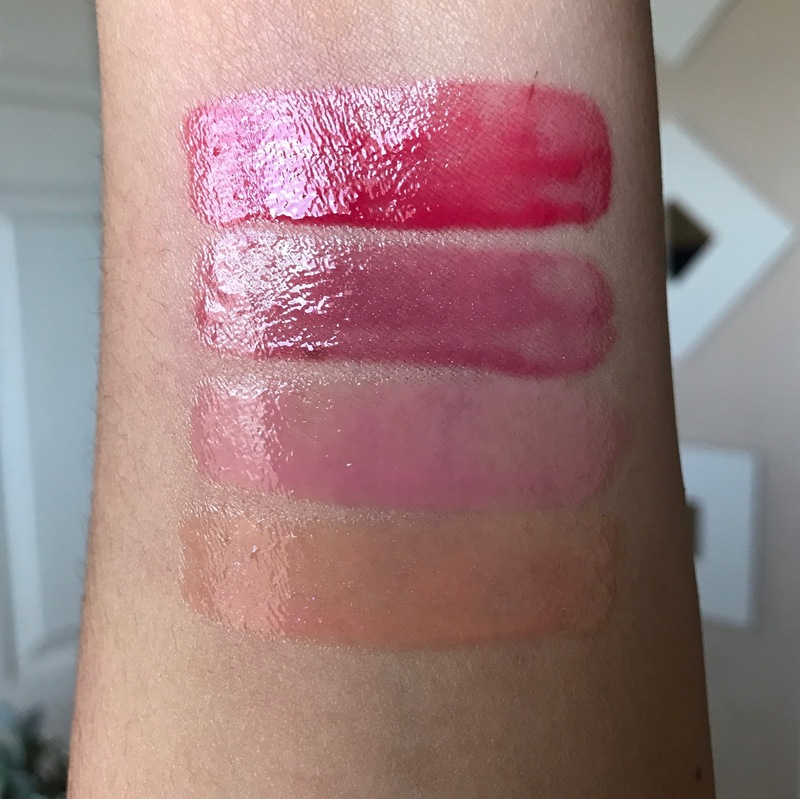 But I have heard a lot of hype about the Marc Jacobs Enamored Hi-Shine Glosses and being a lover of makeup and Marc Jacobs Beauty products, I couldn't help but to always be curious about them. That's why my blinders turned on the minute I spotted the Marc Jacobs Beauty Enamored With Shine Lip Gloss Collection on the Sephora site two days ago. This set contains 4 travel-sized glosses with .05 oz of product per tube for $32. One full-sized Marc Jacobs Beauty Enamored With Shine Lip Gloss costs $28 and contains .16 oz of gloss. While the value ($48) of this set is not super high, because the glosses are pretty small, I do think this is a really great collection. While the box is smaller in person than what you imagine it will be, you still get that very lux Marc Jacobs design and the glosses are super cute in person. These smaller tubes definitely don't look or feel cheap, they are just smaller versions of the larger tube. Let's take a closer look at the four shades included in this collection. French Tickler: an iridescent pink shimmer - this one has the most stunning purple, fuchsia shimmer, it's so pretty. If you can pull of this shade, which I can not, then I think you will love this shade. Hey You! 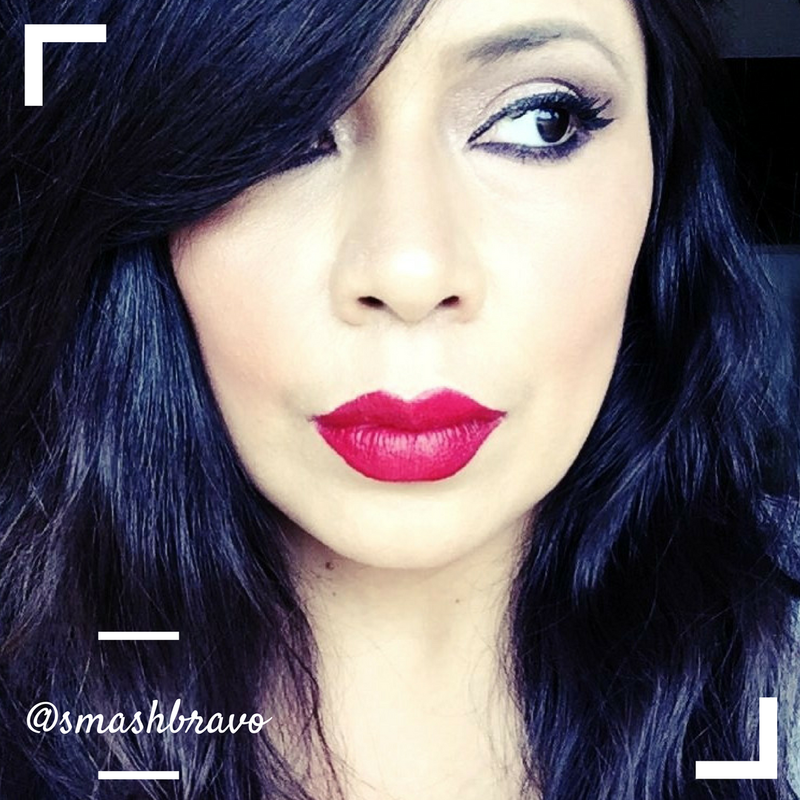 : a fuchsia cherry - I love this shade, it is the most pigmented of the four and perfect for all skin tones. Pink Flamingo: a very light bubble pink shade. This more cool toned pink doesn't mesh well with my skin tone unless I use it to top a darker lip color. The shade itself is pretty, but like French Tickler, it might not work for all skin tones. Allow Me: this is a rosy shimmer and by far my favorite of the four shades. In the tube, this shimmery shade is so pretty and I happily noticed that the shimmer finish is also noticeable on the lips. I am putting this shade on my Sephora wishlist immediately. Swatches of the Marc Jacobs Beauty Enamored With Shine Lip Gloss Collection. As you can see, these glosses have a very high-shine finish. These are not for someone who does not like a high-gloss lacquer-like finish. Most important though is the formula, this is what I really wanted to try out. These are so velvety soft and felt so good going on my dry lips, I could have kept applying it for days, it was almost soothing. I can definitely see why all the hype with these glosses, they are a pleasure to wear. 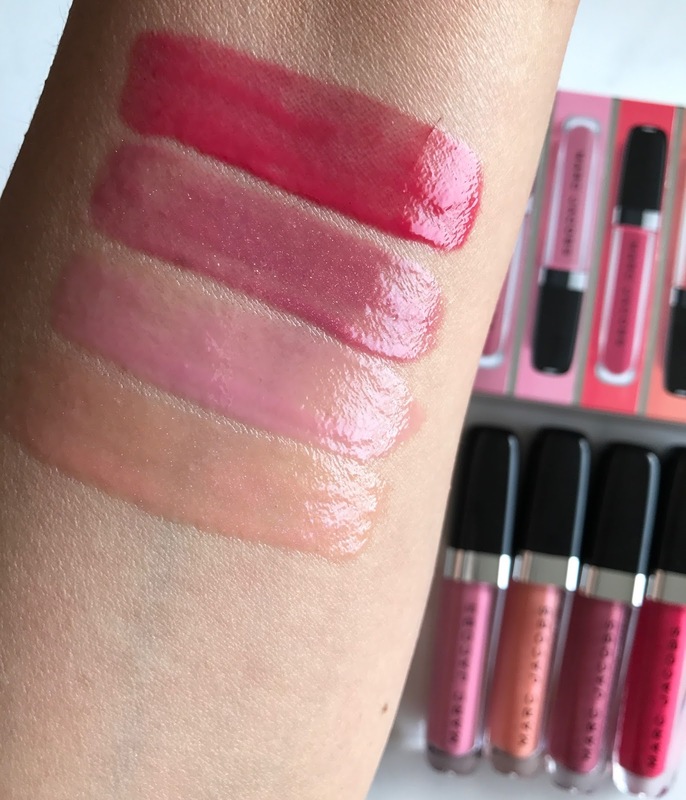 Overall I think the Marc Jacobs Beauty Enamored With Shine Lip Gloss Collection is a nice way to try Marc Jacobs glosses for the first time. 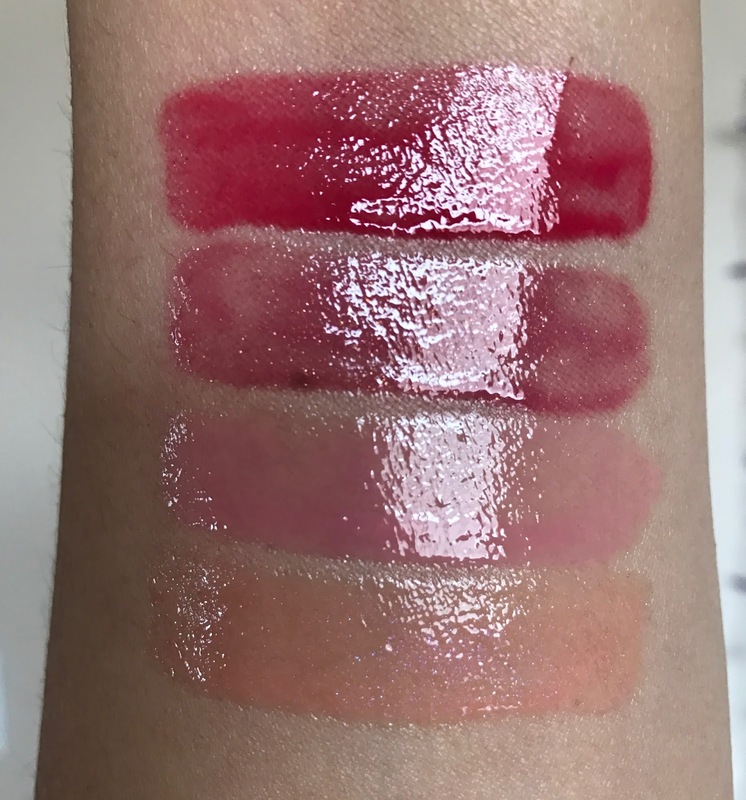 Or if you're already a fan of his glosses, this is a nice way to try four more shades for a little bit more than what it costs to buy one full-size gloss. Or maybe you're like me - you like to wear gloss every now and then and chances are that you're never going to finish a full-sized tube. These smaller sized tubes, could be right up your alley. Find the Marc Jacobs Beauty Enamored With Shine Lip Gloss Collection at Sephora.